Performance Standards are coloured ranges that appear with data in the Athlete History and Reports Modules. They are also used to help colour injury and illness status, or can help users see different performance ranges when entering data into a form. If a Performance Standard is set up it will appear in the background and if you mouse over the field the coloured ranges appear for that field (as shown here). 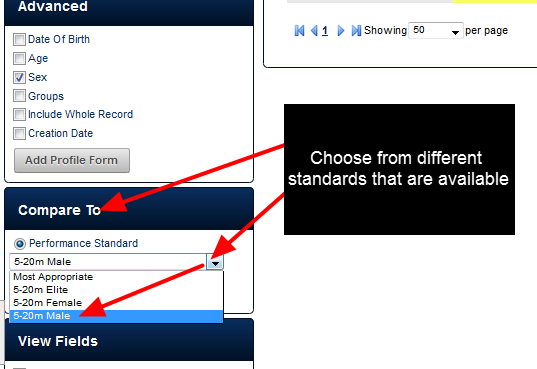 In the "Compare To" area you can click on the Performance Standards drop down menu and if any other Performance Standards are available, you can choose a different one to compare you data against. 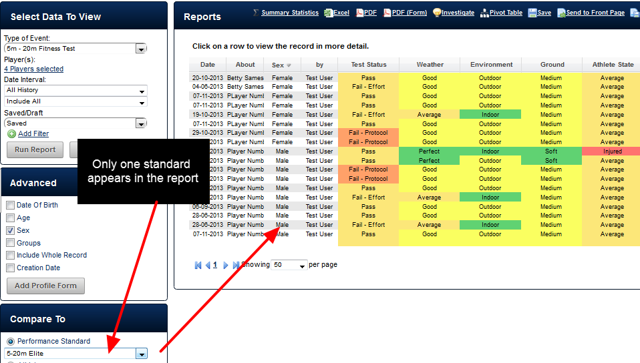 The system can only select one of these standards to show in each report you run. The system automatically picks the most appropriate Performance Standard to appear in the Report. The example here shows that both Male and Female athletes are included in this report. Because neither a Male or Female standard are appropriate to display, the system shows the "Elite" performance Standard that was created. N.B. If there were only two standards (a Male and a Female standard), it would choose one standard to appear based on which gender was the most predominant in the report. If you have set standards that you need to compare specific athletes against, try and set up different reports based on gender or age brackets. The example here shows that a separate female and male report are being generated so that male and female data can be viewed and compared separately. Once you create your report, Save it for when you need to view it again. Once you create your report structure (e.g. 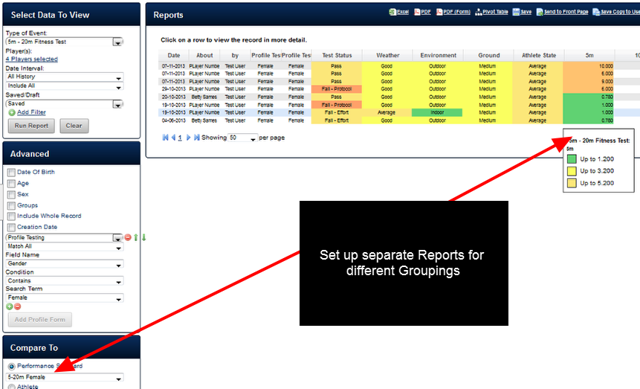 your groups, filters and performance standards), click on Save and save the report structure so you can use it again.